Having reached the city, we were glad to see a big banner with the title ‘The world blacksmiths championship – 2005’ hanging across the road and started looking for a parking place. There was an improvised exhibition ground for the blacksmiths’ works in the central public garden of the town. The place for competition holding was well-appointed. There were ten furnaces and anvils, some big standing-vices, all the necessary tools for handwork, and a broad range of rolled metal under a big shed. From 9 a.m. till midnight blacksmiths-demonstrators, changing each three hours directly the bell rang, had been surprising with their skill the numerous audiences on specially mounted platforms. It was possible to fix the finished works on the prepared by the organizers stone or wooden holders and place them on the very long table along the main street. The jury controlled the time and labeled works of the participants who had managed to implement their creative concept over the period of three hours. The championship subject was a sacral art. Apart from blacksmiths who got the 1st, 2nd and 3d prizes in team and single competition (women’s performance was estimated separately) all comers could participate in the contest. In separate hall they had to draw a project of a forged work on the same subject. It was the 16th biannual meeting in Stia. Owing to these championships Stia entered the Ring of European Cities with Iron Works that popularize and develop blacksmiths art and handicraft. Other members of the Ring are Bad Hall, Ybbsitz (Austria), Mogliano Veneto (Italy), Mynämäki (Finland), Gniew (Poland), Friesoythe, Kolbermoor, Stolberg, and Olbernhau (Germany). Other squares and streets of the town became exhibition pavilions of blacksmiths and companies producing tools and equipment for art blacksmithing. It should be pointed out that there were a lot of blacksmiths wanting to forge in the open air (though it was quite hot). On Friday afternoon there was no place left for demo recording. There were representatives of many different countries at the championship. Besides Italians there were large groups of blacksmiths from France, Israel, Germany, and Austria. All the forged works were made neatly and on high professional level. They were the result of interesting technical and decorative decisions. It was a mystery how the jury headed by Elan Envas (Great Britain) would define the winner as there should be not only the skill but also the idea, creativity estimated in art. Though, on Sunday evening works by Frenchmen were awarded. 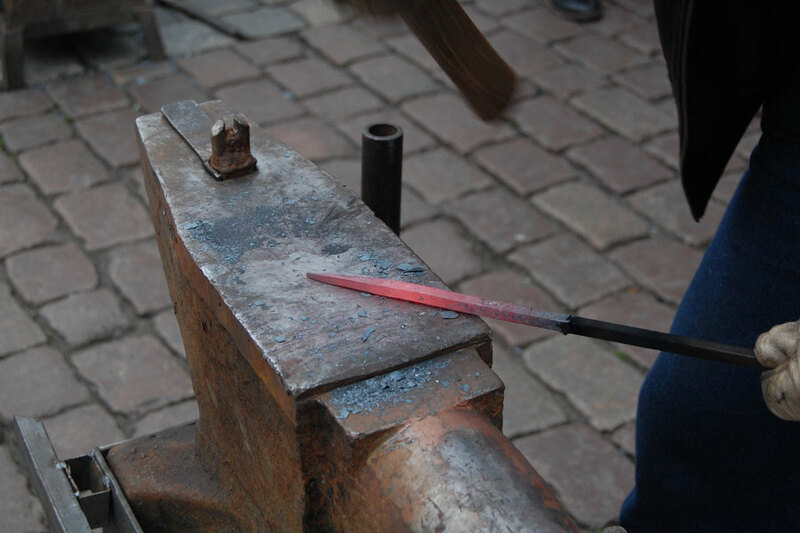 The jury also estimated in different nominations the works by Italian blacksmiths participated in the commercial fair. This year there were many works of different style and design at the fair. The pavilions were also differently decorated. Such meetings are very positive as they imply communication with people, new acquaintances, new impressions, and, as a result, mutual enrichment of different cultures. See you in Stia in two years… Why not? !